Guest article by Karlis Kalnins. Every update for Adobe Lightroom comes with hopes for performance improvements, but results in disappointment. Everyday image editing of RAW-files as well as importing and exporting media can take up an excessive amount of time. While I unwind from my latest wedding reportage, my computer already spends night and day importing or exporting files. Your computer may have between 2 and 8 real and virtual processor cores, but Lightroom will only use 1 or 2 of them for import & export of files. Adobe Lightroom not only comes with this performance flaw, but it also limits access to only one catalogue at a time. Competitors like CaptureOne are one step ahead by handling multiple catalogues simultaneously. If you are bound to Lightroom however, there is a simple workaround: while we cannot clone ourselves, we can certainlny do so with Lightroom! In this case each Lightroom installation will use different segments of the CPU and by doing so you can import or export files two or three times faster! 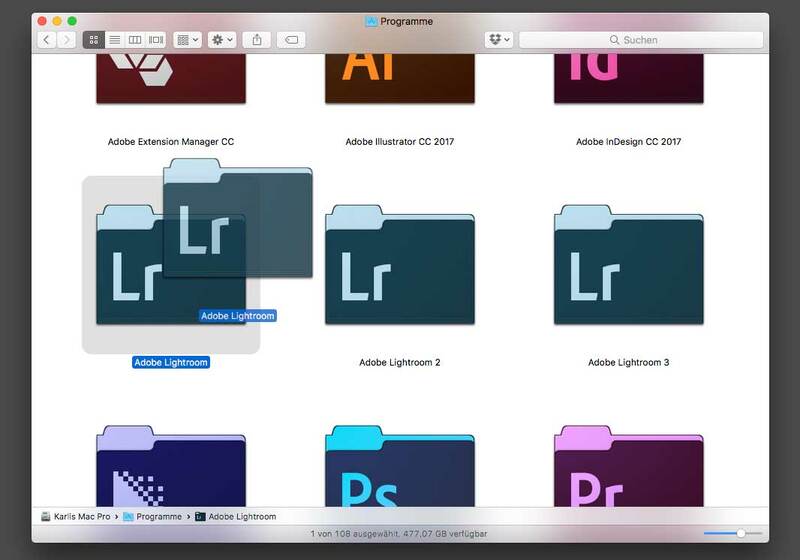 Navigate to the applications folder on your Mac and duplicate the entire Adobe Lightroom folder by holding the Alt key. You can apply this as many times as you like, but don’t overdo it! Three instances are sufficient for my needs to work in multiple catalogues and utilize the power of my Mac. Caution: always open different cataolgues within each Lightroom instance! Handling one catalogue in multiple instances can lead to unexpected consequences. Lightroom can generally work easier with several small catalogues that are sorted by year or assignment, instead of one giant archive that demands extra performance. Different catalogues can be moved between Lightroom instances by simply dragging and dropping them around, or hold the Alt key while launching the application to select the desired catalogue. If you use this trick, you can clone a catalogue of an edited wedding and export different JPEG resolutions at the same time. Or you can simply export different weddings/events at the same time! I take no responsibility for trying this method, but if you have further questions feel free to contact me via my website: www.karlis.de. And if you want to get rid of the JPEG export problem all together just let the ProImageEditors team export all the JPEGs in desired resolutions and quality after they have done the editing! This entry was posted in Workflow and tagged Image processing, Lightroom Workflow, Quicktipp, wedding photographer. Bookmark the permalink.